A leaf with omega-3 fatty acids? Impossible! Yes, It is unbelievable but true. These soft and succulent leaves have more omega-3 fatty acids than what some fish oils have. A perfect option for a vegetarian. 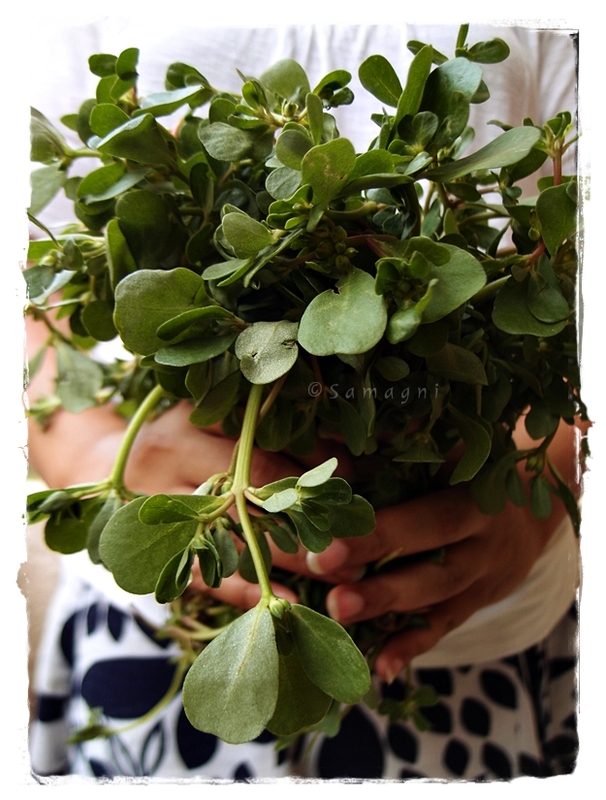 Pigweed / Purslane / Kozhuppa cheera is a weed like plant that grows almost everywhere, by the roadside and in backyards. This wonder weed is very low in calories and fats but rich in minerals, vitamins, and fiber. Tender stems and flower buds are also edible. Make a thoran / stir fry out of it and serve with rice. Not just nutritious but delicious too. Add finely chopped onion and garlic. Sauté until they turn pink. Add chopped purslane leaves and turmeric powder. Mix well and close with a lid. Cook in slow fire for about 5 mins stirring occasionally. The leaves will shrink and become soft and darker in color. Not so long ago, when our backyards were not manicured, we had an abundance of greens such as Punarnava, Poovamkurunnila, Thiruthaali, Manithakkaali, karuka, thumba, the list goes on. They grew like weeds but were very useful and handy for first aid. When you notice signs of mouth ulcer, just walk across, pluck a few manithakkaali leaves and chew them with noticeable relief very soon. 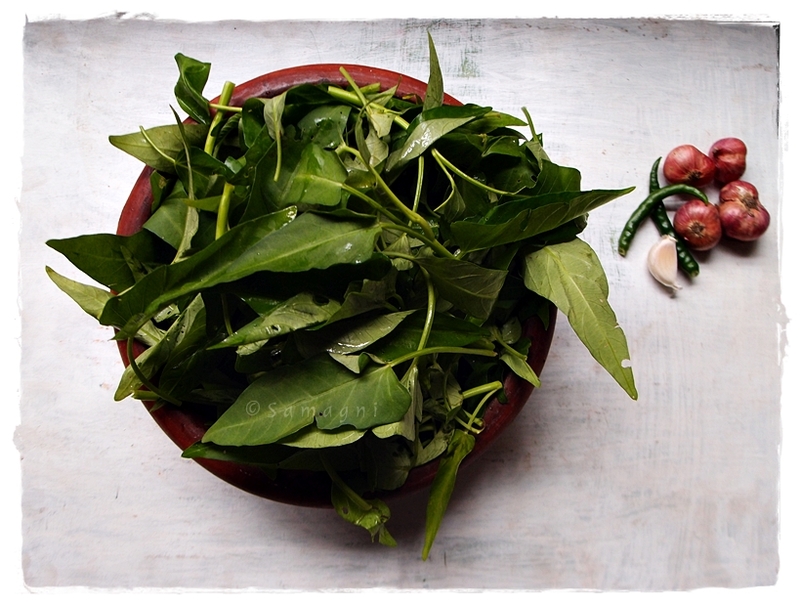 Olden days in villages, people survived only on these wild greens and vegetables from the backyard. Apart from raw mangoes at various stages, jackfruit, different types of gourds, yams, brinjal, ladies finger, and various greens were used in everyday cooking. These were tastier and more nutritious than the vegetables in the market. Visiting the vegetable vendor was rare during those days. Like the Malayalam proverb goes, “muttathe mullakku manamilla,” which can be loosely translated to we fail to appreciate what is available to us easily and in plenty. But, now when we battle a multitude of health issues that we fail to even identify, we rediscover old habits that helped us stay healthy. Not only are these healthy but tasty as well. One of the most common uncultivated greens that grows wild all over the country is the common creeping weed Punarnava / Hogweed / Thazhuthama. It has tiny pink flowers. In Ayurveda, Punarnava is known for its anti-inflammatory, diuretic, and analgesic properties. All plant parts, such as the flowers, leaves, stem, and the roots are beneficial and have specific medicinal uses. The plant leaves are nearly round in shape but can vary in size from one plant to another. Punarnava, as the name denotes, has the tendency to rejuvenate. It can be grown easily by stem cutting. 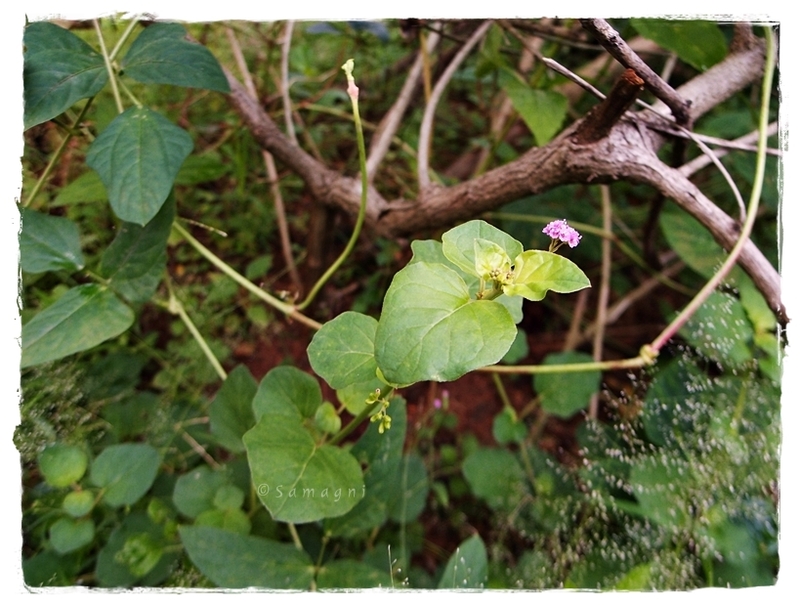 Pluck the Punarnava leaves and remove the hard stems. Wash and clean the leaves thoroughly. Drain the water from the leaves and chop finely. Heat coconut oil in a wok. Add the mustard seeds and let them crackle. 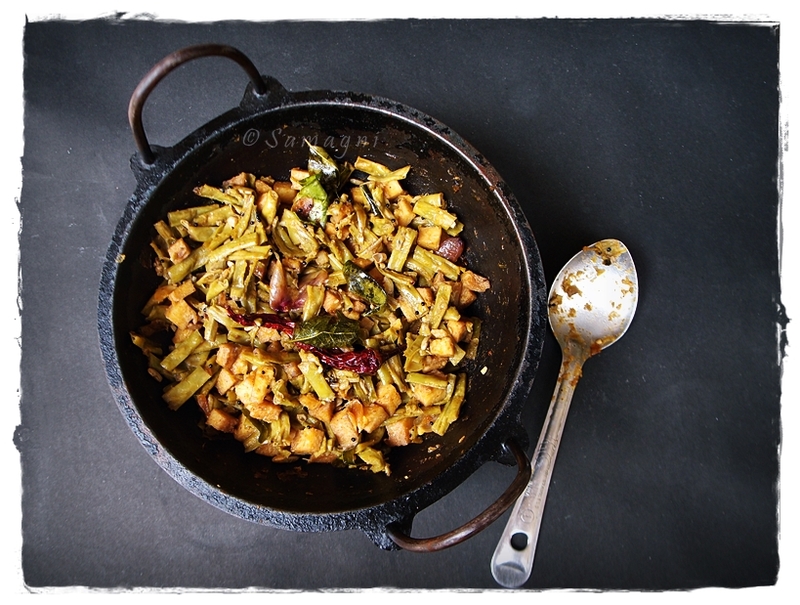 Add chopped onions and stir for a minute then add the turmeric powder, slit green chilies, and chopped Punarnava leaves. Stir well. Cover and cook for 5 minutes in low fire, occasionally opening the lid to stir, until the green leaves just start to wilt. The leaves, when they get cooked, reduces to half or one-third. When the leaves turn dark green, add salt, and stir. Add grated coconut and stir well. Serve with rice or roti.